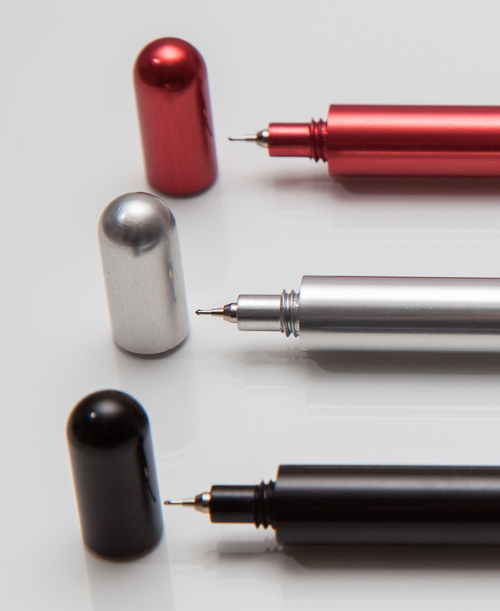 We are creating simple yet beautiful pens out of machine milled aluminum. The Premier Pen P1 is designed to fit easily in your pocket and go with you everywhere. Whether it is important notes at work, a stroke of creative inspiration or even the mundane grocery list - you'll enjoy writing more than you thought possible when you have a Premier Pen P1 and a Pilot G-Tec / Hi-Tec-C cartridge. Thanks for joining us on the journey - we're excited to get the P1 in the hands of as many people as possible! If you missed the Kickstarter project - sign up for our mailing list (in the right hand sidebar of this page) and you'll be the first to know when we start selling the P1s. For now, the focus is on getting the backers their pens!